Strictly speaking, this could be seen as correct, but unfortunately only if you apply the definitions of anonymisation and pseudonymisation as they are stated in the law. These deviate from what we actually see in daily practice. I’ve put this to the test a few times by asking a number of family members and friends to anonymise some data for me. They’ve invariably limited themselves to removing directly identifiable data, such as a name or citizen service number, or by pasting a black censor bar over a photo. Personally, I think legislators have made a mistake by creating a differing definition of ‘anonymous’ and not defining it explicitly. It would have been better not to use the word at all. Here, too, the definition is broader than what is seen in practice, so this is about more than just technical measures. Read what I have already written about this. The document on anonymisation published by the joint supervisory authorities in 2014,’WP 216’, is crucial when it comes to clarifying the difference between these two definitions. The definitions contained in this document did not change significantly in the GDPR and are therefore still relevant: the essential difference between anonymisation and pseudonymisation is that anonymisation is an irreversible process and pseudonymisation is a reversible one. The phrase “or by another person” is often disregarded here. The fact that you do or do not pass along the data to others is not relevant to the test. The test forces you to assume a scenario in which the data is public, which would be permitted if it were no longer covered by the law. You have to ask yourself whether there is anyone on earth who could possibly trace (parts of) the data back to individuals. The answer to this question is nearly always a “yes”, which means there personal data remain. I.e., you can mask, hash, blank-out, pseudonymise and anonymise, but as long as you do not aggregate data (merge data into groups) and the original data continue to exist, each processed set will remain a set of personal data. First and foremost, do not be misled by statements that data have been anonymised and/or made anonymous and therefore no longer fall under the GDPR. They have probably been anonymised, but personal data most likely as well. If you take this as your starting point, you can focus on processing it as carefully as possible. Now back to the initial question: What is the difference between anonymisation and pseudonymisation? The conclusion is that, in essence, there is only one difference: whether the process is reversible or not. Reversible techniques are forms of pseudonymisation and non-reversible techniques are forms of anonymisation. Both are examples of techniques which fall under the heading of Privacy Enhancing Technologies. They are essential measures for the protection of personal data. You have to determine which technique is appropriate for each situation. To show just how much ‘static on the line’ there is around all these terms, in a subsequent article I will discuss pseudonymisation services that are demonstrably irreversible and should therefore be seen as anonymisation under the GDPR. In his role as a data and privacy consultant, Edwin has mainly been involved in large BI projects for the past eighteen years. 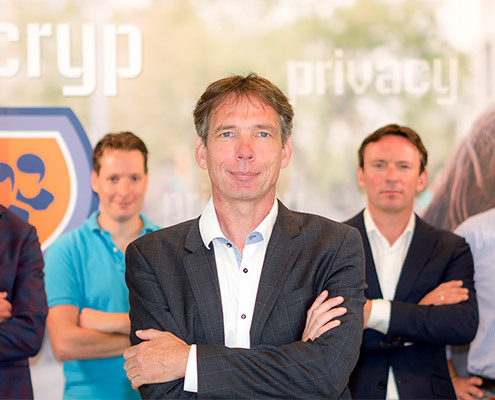 He increasingly noticed that clients had certain customer analysis requirements which were in conflict with the Dutch Data Protection Act (a forerunner to the GDPR). As a result, he went in search of a solution that would still make carrying out such analyses possible. The entire playing field of the definition of the law was the starting point, but he also had to take into account such customer priorities as time-to-market, quality of service and compliance costs. The creation of a specific, separate company, today known as ViaCryp, proved to be the most effective solution for clients when it comes to navigating this complex world. Edwin regularly speaks on privacy matters at seminars and congresses, and is a member of the NEN working group for the development of a pseudonymisation standard.